For millennia people have prayed to God, or the gods, for healing. No-one really knew if people were truly healed as a result, and there wasn’t really any way to check. But in recent decades medical scientists have tried to test whether prayer assists healing or can change the course of a disease or injury. This report is a fair summary. How do you test if God has been at work? Pretty much everybody agrees that we cannot scientifically test the actions of God, if he exists. So research has focused on whether people who are prayed for recover more than those who don’t, without trying to define the cause (though everyone on both “sides” knows where results might lead). But this is still a difficult question for scientific medical research, because it is difficult to design an experiment to test prayer. Generally the best design for scientific medical studies is a randomised controlled trial, which divides the patients being tested into at least two similar groups, one of whom receives the treatment and one does not. Neither the patients nor the researchers should know who is in which group. The statistical differences between the outcomes (if any), allow conclusions to be drawn about whether the treatment was effective. People have to be found who are willing to pray for people they don’t know, perhaps identified only by first name and initial, and confine their prayers to only that person. Many christians object to such a study, and some studies resort to pray-ers who don’t even believe in God and/or in prayer. No-one knows if other people are praying for either group, so the study can never be fully controlled. Few christians pray this way – most prayer would be personal, with touch and interaction. Thus these studies are not really measuring prayer as practiced by christians. Such studies are designed to test repeatable occurrences governed by natural laws, whereas prayer is (supposed to be) a request to a supernatural being who may choose to grant the request, or not. Thus the studies do not measure miraculous healings, but slight improvements (though I guess they would record a major healing if such occurred). They are not really measuring the miraculous intervention of God, but the possibility that prayer is a useful therapy alongside other therapies. It turns out that these types of studies are inconclusive. Different studies and different reviewers reach different conclusions. I have listed all the 26 studies I have come across in Intercessory prayer and healing, and found that they were about 2:1 in favour of a small but discernible positive result for prayer. However many of the studies (with both positive and negative outcomes) have been criticised. In the end, I don’t think these randomised controlled trials tell us a lot one way or the other. Compare medical records before and after prayer. Survey how sufferers feel about the effectivenerss of healing prayer. Conduct clinical trials and measure selected health markers of the patients. Follow up patients some years later to see if the effects of prayer are lasting. There is some evidence of positive outcomes for all of these, but her attempts to undertake field trials with people seeking healing (#3 in the list) has been controversial. Because this approach attempts to measure the effectiveness of people actually seeking healing from a christian healer, there can be no control group who are not prayed for. The test therefore involves measuring physical capability (in this case, hearing and sight) before and after prayer for healing. Professor Brown travelled to Mozambique and tested people seeking healing of sight and hearing from christian healing evangelist, Heidi Baker. She found statistically significant improvements in the small sample of 24 people seeking healing. Similar positive results were obtained from another small study in Brazil. Brown has been very clear that this is only a preliminary study, to see whether there is a prima facie case for healing that should be tested further. She is clear that there were many problems in the field measurement (e.g. ambient noise, tests based on measurements of patients’ responses) and many difficulties in interpreting the results. She concludes little more than that the tests were positive enough to warrant further and larger studies. Those of us interested in the possibility of divine healing can therefore see these studies as a small piece of evidence that divine healing has plausibly occurred. No-one should change their worldview because of these studies, but they shouldn’t be ignored either. Several reviews (e.g. this one on Internet Scientific Publications) took a non-partisan approach when they reported and reviewed the study. But it has been interesting to see sceptical reaction to Professor Brown’s work. Of course there were brief and rather mocking references, such as this one ( Brown’s study is mentioned towards the end under “News stories”). But while I have found several more serious comments, they have all been based on this one review by Tom Rees: A truly dreadful study into the effects of prayer. Rees is a medical writer, but his review does not appear to have the objectivity or accuracy one would expect. Brown has outlined in detail (in her book and in several articles on the web) the problems with the randomised controlled trial approach for answering the question of whether there is a plausible case for unusual recoveries after prayer, and then argues for her approach in the Mozambique study. But Rees doesn’t refer to any of that, and so he never grapples with the difficulties, nor does he recognise that this was a preliminary study. And he never offers any alternative method that addresses the difficulties, but rather would apparently prefer that no prayer studies were performed. So he points out there was no control group, which Brown acknowledged and explained, but he doesn’t discuss why that was the case, nor Brown’s claim that hundreds of medical studies have to be done this way for similar reasons, nor offer an alternative study design to meet the requirements of the question Brown was trying to answer. Rees points out that the hearing and sight tests undertaken relied on the patients’ responses, which are of course somewhat subjective and idiosyncratic, and therefore open to error. Again Brown acknowledged this difficulty, but the results weren’t entirely subjective – identifying letters or shapes on an eye chart is objective and an audiometer was used for the more subjective hearing test. But Rees goes on to suggest the results were the result of the demand effect, where subjects consciously or unconsciously respond in a way that they think is going to please the experimenter. Rees says: And that simple trick explains why both hearing and sight appears to have dramatically improved among these poor, superstitious villagers. Both they and the researchers have conned themselves. This explanation ( a simple trick ) is presented as if it was factually what occurred in this case, without any evidence. I don’t see how Rees could be so sure. He makes no attempt to explain how a subject can fake a good result on an eye chart. It remains possible, of course, that the subjects thought ahead enough to deliberately perform poorly in the initial tests in a sort of reverse demand effect, to show a better result later, but it seems pretty far-fetched to me. Brown addresses demand effect, and points out that subjects reported their impression of any improvement as well as having this improvement measured, so that demand effect was likely to be seen there if it occurred. And she points out that the results are far more positive than previous studies of demand effects and suggestion have found. Rees criticises Brown for not recognising and testing for the placebo effect, concluding: Perhaps we should sit Candice down and make her watch [a video on the placebo effect] before she tries her hand at any more medical research. This is perhaps the most obvious place where Rees has shown bias. Leaving aside the derogatory tone of that comment, he fails to report that Brown discusses the placebo effect and agrees it must be considered. She references studies on suggestion and hypnosis that show that these result in very little improvement in eyesight, certainly much less than that recorded in the study. Rees doesn’t mention this. Tom Rees hasn’t shown objectivity in his mocking tone, his failure to grapple with the issues that led to this study and to suggest alternative approaches, his failure to acknowledge how Brown tried to address many of the difficulties he raises, and his alleged explanations without evidence. He doesn’t give her any credit for the difficulties she was attempting to overcome. He apparently would rather no-one studied the possible effects if prayer. Brown’s study was only preliminary, as she makes clear, yet it obtained some interesting results. Rees doesn’t believe in God, and so doesn’t believe those results could have occurred via miracles, and so has to offer some other explanation, even if he can really have little idea if that explanation is consistent with the facts. Of course we all have biases. As a christian I would hope for positive results, just as Rees, an atheist, would be wanting to see negative results. Brown, who I think is a christian, would have her expectations too. But I think a more guarded approach is warranted by everyone. Brown makes no sensational claims, and is very cautious. I have tried to be fair in my reporting of both sides. It is a pity Rees couldn’t have been more objective. Sceptics often say that there is no evidence for miraculous healing. But of course there will never be any evidence if you unfairly dismiss studies that attempt to gather it. I hope Brown does more work on this, not give up on it. 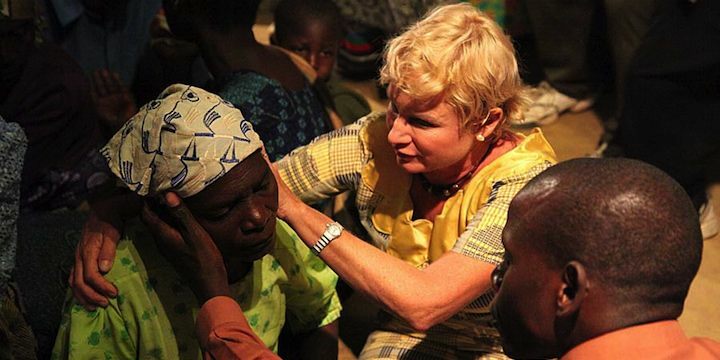 Picture: Heidi Baker praying for healing in Mozambique, courtesy of Iris Global.